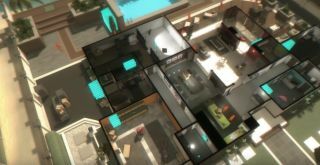 No Trace, the debut project from British development studio Square Mountain, is a top-down stealth/assassination game that draws inspiration from many places. At first glance, the Hitman series and Hotline Miami are obvious influences, but with a longer look you might get vibes of Volume and Bullfrog’s 1993 classic Syndicate too. Disguises and multiple ways to dispose of targets à la Hitman? Check. Low poly visuals, stealth and meticulously designed levels similar to Volume? Yup. Loads of guns and death as per Hotline Miami? That’s right—from what's on show there, No Trace borrows from the best and the combined result is something that’s got me quite excited. On top of that, Square Mountain promises randomly generated NPCs with randomly assigned traits, a range of “hi-tech gadgets”, lethal or nonlethal techniques, and an Inspection mode that allows players to “pause time and scan the environment to plan the perfect approach”—the latter of which sounds akin to the enemy tracking system popularised by Far Cry. Having started work on No Trace in September last year, Square Mountain says it’ll be ready for launch in “Q4 2016”—so somewhere between October 1 and December 31, to you or I.